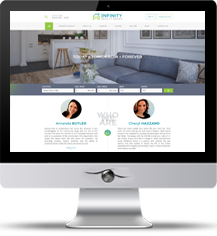 Your website will come with the latest and greatest in lead capturing and buyer & seller tools, such as email alerts, property organizer signup, home valuation request, and a control panel to see all activity. Your site will also come with strong SEO power. Every listing page and detail page will be SEO optimized, giving you potentially thousands of pages that can rank in search engines! We offer three options depending on your need MLS needs. All packages include fully managed hosting, as well as ongoing security updates, performance updates, and support after development. Select the option below that suits your needs! Once payment is complete you can fill out the request form and our website team will start designing your website. Hosting is what keeps your website online 24/7. Your hosting includes all setup and support, as well as automatic malware scanning and two rolling weeks of backups. We will also help with your email and domain settings. We stand behind every website we build! As part of your package, we provide ongoing security & performance updates, and downtime monitoring. You may also submit support tickets for any website help needed. Your website will be custom designed to your preferences so that it’s perfect for you. We will help you show who you are in the best possible light! Your website will be 100% mobile responsive, displaying perfectly on all device sized from desktop to mobile. More than half of all searches are now done on mobile devices! 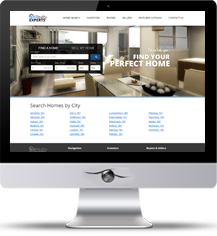 We will integrate your website with your local MLS provider, bringing your website full MLS listings and search functionality. All of these pages are SEO optimized and primed to rank in Google. Your users will be able to log in to their own personal accounts right on your website. From there they can manage their saved searches and properties, making your website very interactive! Your visitors can sign up and receive emails with listings matching their search criteria. These listings link visitors straight back to your website, making your site the hub of their property searching experience. You will have a detailed Valuation / CMA Request form, giving you the information you need to assess the value of the seller’s home. This is yet another highly effective lead capturing tool that will come with your website. Your Control Panel is where you can see all of your leads and website activity. Activity from the Property Organizer, Email Alerts, Valuation / CMA Request form, and general searching is recorded here in a user friendly format. Every detail page will present the visitor with 3 highly visible options: Schedule a Showing, Save the Property (to their Property Organizer), and Request more Information. These calls-to-action entice the user to contact you with every property view. Your website will have potentially thousands of pages poised to rank in search engines. This will allow potential clients to find you easily. We will create as many pages as you’d like to provide content for. Examples of content pages are: About Me, For Buyers, For Sellers, Testimonials, Resources, Neighborhood Information, and whatever else you’d like!